When armed with current member and equipment data, incident commanders can make the right decisions, quickly and efficiently, when faced with a crisis. Mission Manager enables first responders to obtain, manage and share critical information during emergencies or events. This helps ensure a successful mission execution. Armed with current member and equipment data, incident commanders can make the right decisions, quickly and efficiently, when faced with a crisis. Mission Manager enables first responders to obtain, manage and share critical information during emergencies or events. Mission execution begins here, where team leaders can create and manage missions ranging from severe weather events, tactical callouts and natural disasters to search-and-rescue missions and training events. Users can select the type of mission from more than 20 pre-set mission types – each with unique features – or they can create their own mission. The description includes the location of the mission, including command post location, objectives, weather information and communications frequencies. A leader can quickly assemble and staff a team, provide the members with the proper equipment and assign them to the field from a single device – and then view their activities in real time. Upon arriving at the mission, members are required to enter their name, email or ID number to check-in. Only active members can log into a mission, but administrators can quickly add new guest members from other agencies as needed. Once an existing member is checked-in, incident managers can view their certifications and window of availability. Team deployment is quickly accomplished using this simple drag-and-drop screen. Checked-in, field-ready personnel will appear in the “available personnel” column, so they can be assigned to a team. Members can then be added to teams and other positions in the ICS with a simple drag-and-drop. A vast amount of data is captured here, including a missing person’s or suspect’s name, address, point last seen, physical description, clothing, medical conditions, personality traits, mental capacity, vehicles, witnesses, friends and much more. The information can be printed in ICS format for confidential briefings or exported as a distributable missing person’s flyer. 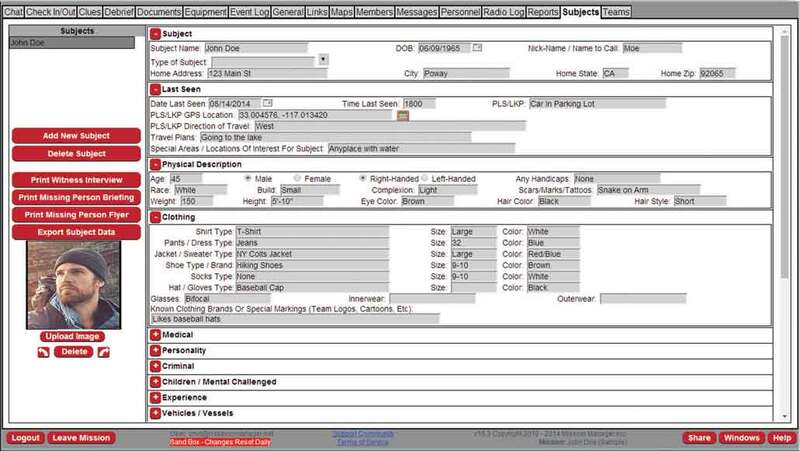 Members can document and/or view various clues found in the field, including description, location, photo and chain-of-custody information, and distribute the information to Mission Manager via their cell phone. With geocoded location information, these clues will automatically appear on the mission map. Mission Manager will record a printable log of clues provided for each mission, allowing users to create a clue report following the mission. Base Layers: Includes several choices of base layer mapping, including Google maps. Overlays: Approximately 106 map overlays with custom transparency levels help planners create truly custom maps. Overlays include major categories such as topography, aviation, weather, points of interest, hospitals, police and fire stations, schools, social media feeds, transportation features, boundaries, cameras and natural hazards such as earthquake fault lines, floods, hurricanes and fires. Up to five additional custom map links may be entered in the system. 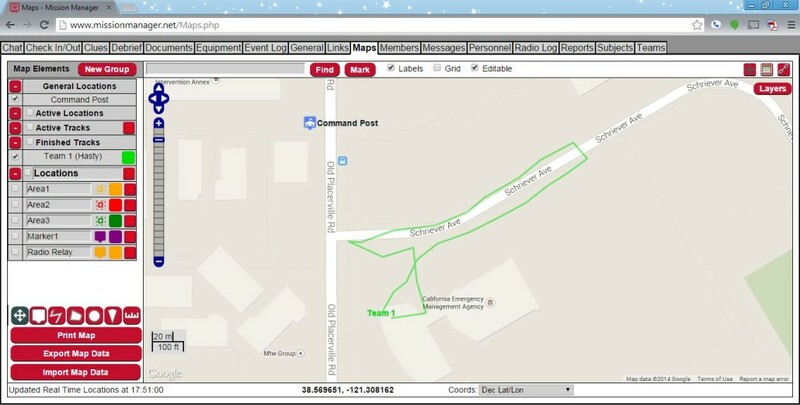 Map Elements: Allows users to drop markers onto the map to identify major items, such as command post, lost subject information, clues and staged equipment. Area Sectioning: Generates custom drawn areas using polygons, circles and pies. Draw lines to represent team assignments or other paths. Tracking: Enables users to draw tracks of teams in the field, based on communications or real-time, auto-tracking using a third-party tracking system that links into Mission Manager. Includes several choices of base layer mapping, including Google maps, as seen in this Maps Overview tutorial. Approximately 106 map overlays with custom transparency levels help planners create truly custom maps. Overlays include major categories such as topography, aviation, weather, points of interest, hospitals, police and fire stations, schools, social media feeds, transportation features, boundaries, cameras and natural hazards, including earthquake fault lines, floods, hurricanes and fires. Up to five additional custom map links may be entered in the system. Allows users to drop markers onto the map to identify major items, such as command post, lost subject information, clues and staged equipment. Create terrain elevation profiles. Use path command to draw lines estimating a route that a team might take. Generate custom drawn areas using polygons, circles and pies. Enables users to draw tracks of teams in the field, based on communications or real-time, auto-tracking using a third-party tracking system that links into Mission Manager. Filters: Can be used to send messages to the entire team or a subset of the team. 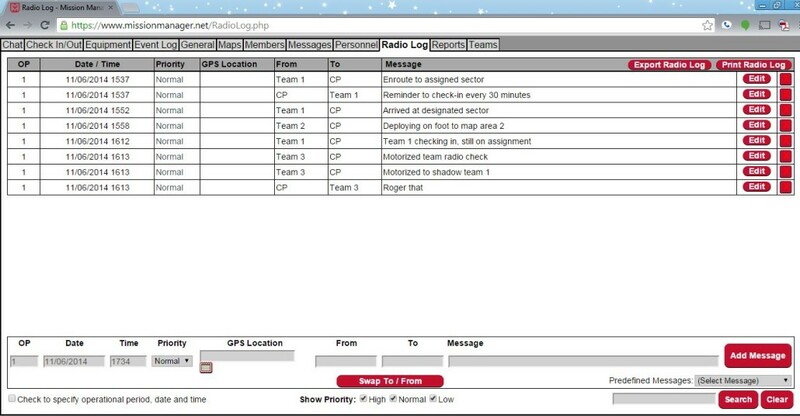 Responses: Team members can send an email to Mission Manager indicating their status for a mission, such as responding, not responding or arriving on scene. Voice phone call: Mission Manager can call your team member, read a text message or play a voice recording. Every change to every field in Mission Manager is automatically logged. This provides a real-time, second-by-second record of what has transpired, including all messages sent out or received. A complete data log of all inputs and edits is stored in Mission Manager for legal compliance. Administrators can track members’ hours in customizable categories that can be sorted by mission, training and public relations activities. This information is useful for minimum participation requirements, awards and recognition, reimbursements and hourly totals for payroll. 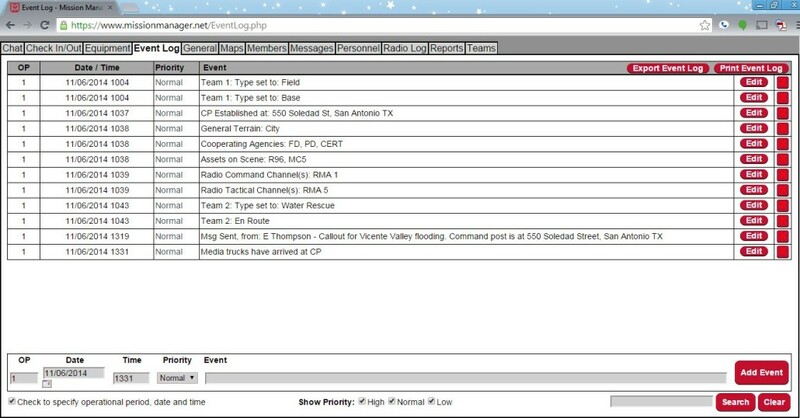 Mission Manager generates automated reports from mission activities, including clue logs, event logs, mission briefings, subject flyers, radio logs, team assignments, debriefing forms, organizational charts and administrative reports. A complete suite of ICS compliant forms is available. All of the data stored in Mission Manager is exportable on demand, subject to the permission-level granted. Critical information is captured from returning field teams for future operational purposes. The information can be exported for post-mission debriefs or printed as a report. 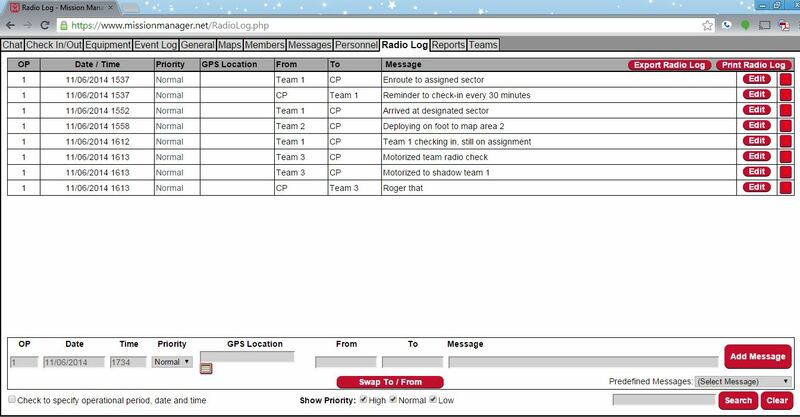 Responses: Team members can send an email to Mission Manager indicating their status for a mission, such as responding, not responding or arrived on scene. 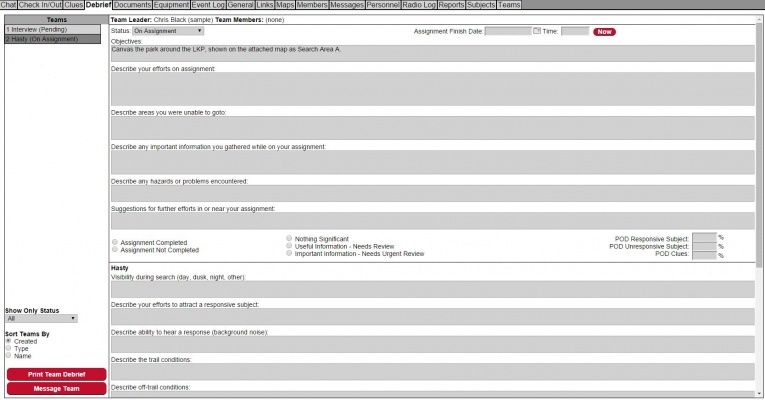 Maintain personnel and asset records for documentation.